Someone Was Nearly Killed Outside My West Adams House. Who Else Noticed? Last month, I was pulled out of my descent into sleep by a shotgun blast from outside my window. I don’t know how I could tell it was a shotgun, but it was unmistakable. I ran to check on my two girls. Both were still asleep. Then I ran to a darkened room to look out the window. Nothing. No people. No bodies. No barking dogs. Had I been dreaming? Then I saw him. A man. Walking down the sidewalk away from me. Not fast, but purposeful. Carrying a shotgun. The barrel pointing up at the sky. I live in West Adams. It was one of the wealthiest neighborhoods in the city at the turn of the century, with sprawling Victorian and Craftsman houses. Successful black entertainers began to move here in the 1940s. Hattie McDaniel, the Academy Award winning actress best known for her portrayal of Mammy in Gone with the Wind, won a famous lawsuit that overturned racist restrictions that kept black people from owning homes here. The 10 Freeway sliced the neighborhood in half in the 1960s, dealing a blow to West Adams from which it has never fully recovered. The delicate ecosystem once known as “Sugar Hill” had been mercilessly bisected. Property values plummeted. Many of the old majestic homes were broken into boarding houses. Still, the neighborhood has always drawn people looking for grand, old, affordable homes. I moved there from Venice in 2000. My husband and I were expecting a daughter and blending a family. We needed a lot of space, something we couldn’t find or afford in Venice. 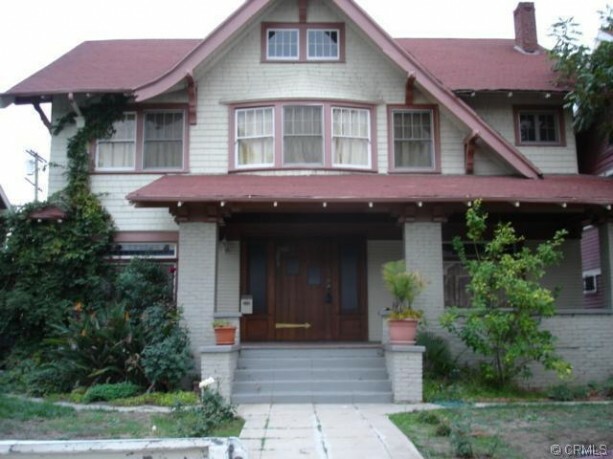 We were drawn to West Adams by the architecture and the possibility of owning a home somewhere central. My husband had also lived there a few years earlier. After searching through many boarding houses and fixer uppers, we found a 100-year-old Victorian. It had two floors plus a full standing attic, four bedrooms, sleeping porches, and grand downstairs rooms. We loved it. It was also on a street with very few apartment houses, which meant our neighbors would be invested in the block. Soon after we moved in, our neighbors, most of whom were black families, introduced themselves. Some brought over home-baked cookies, and others brought pizza and drinks. Having come from apartment living where the concept of neighbor meant annoyances through shared walls, I was happy to be in a real community for a change. My husband and I soon had a second daughter, and many of the neighbors had kids who were around the same age. Because we’d stayed clear of apartment buildings, our street was mostly tranquil. But one property, a 1960’s-era complex, got in the way. It had once been a 15-room motel. Now it was illegally housing developmentally disabled adults. There were fights, shouts, occasional pantless men walking down the street, and a woman who made a habit of urinating on the lawn out front. We kept our girls playing in the backyard. The intersection of Washington Boulevard and Western Avenue was close to our street, and it attracted unwelcome traffic. One night, when my husband was taking our pit bull for a nighttime walk, he was confronted by a young gangster. “Where you from?” asked the stranger. My husband, who is African American, explained that he wasn’t with a gang. The man refused to accept the answer and came closer, lifting his shirt to reveal his waistband–the universal signal for “I’m strapped.” My husband was carrying a nighttime walking stick (it’s more like a bat) and smacked the man hard in the head. The gangster fled. This was right outside of our house. When I heard about it, I got so scared that I had my toddler and my newborn sleep with us on a mattress on the floor away from windows in case anyone came back looking for revenge. We didn’t call the police. We knew there wasn’t much they could do, and we didn’t want to attract that kind of attention. It might lead the perpetrator right to our door. We’ve got to move, I decided. Enough is enough. But the days went by, and the prospect of a move seemed overwhelming. Our house was beautiful and huge. With each successive month the urgency began to dissipate. One solace was the community spirit. We neighbors stuck together. Through any 24-hour period you could always be sure that someone was watching out over the street. Many of the houses in West Adams have wide-open front porches, and anyone sitting on a stoop can see most of the block. In the early mornings, a fireman down the street was outside working on his garden. During the day, a plumber down the street would come home often to see his family and sit with them out front. At night, there was the judge, a night owl who walked his two dogs in the middle of the street, picking up trash and interrogating anyone hanging around on the block. The housing market during these years was steadily heating up. Some people started to cash out. The plumber, who’d lived there all his life, got his house stolen right out from under him by a former brother-in-law. The motel across from our house remained a problem. Then the owner of it was indicted for systematically stealing his charges’ disability checks. The residents were dispersed into other homes. A new owner took over and rented out the small rooms to whoever could put a few bucks together. Low-rent week-to-week rentals attracted drug abusers and hot tempers. The motel continued to be a zone of middle-of-the-night brawling, cussing and police visits. Still, the remaining neighbors stayed tight. We formed a neighborhood group. We chipped in and financed streetlights. The unofficial mayor of the street, a woman who has lived on the block for 40 years, made the LAPD pay attention to our collection of streets. She oversaw a campaign of complaints against the absentee motel owner. It worked. He left. The motel was purchased and run by someone who screened the tenants and cared who stayed there. Real estate eventually reached its ridiculous phase, when anyone with a pulse could get a loan. Korean investors bought a couple of houses and turned them into guest homes for those visiting from the motherland. A couple with a young family purchased a fully restored home for a price we would have thought unimaginable a few years earlier. Two neighbors cashed out and moved to other parts of the city. When the market finally crashed, the Korean entrepreneurs got foreclosed on and left vacant houses, but, despite the economic upheaval, the street also got calmer. With the absentee motel owner out of the picture, the sounds of drunken couples fighting in the street became rare. Police were called less and less. Distance set in with the neighbors. New people kept moving in, but I never learned their names, didn’t learn what kind of dogs they had or what their schedules were. We didn’t really need to watch out for one another the way we had before. When we first moved to West Adams, homeowners in the neighborhood often sat out on their porches. Today, few do. I’m one of those who now spend most of their time indoors or out of the house entirely. The neighborhood has become more ethnically diverse, but also more atomized. Is it ordinary life that causes the distance? Kids growing up and drifting into new communities centered around their schools? The commutes to other parts of town? The two parents working? For me, at least, those are all factors. That night, with my kids asleep, my husband out of town and my dogs quiet, I watched that shotgun and the man carrying it as he walked past all my neighbors’ homes. I realized I couldn’t warn them. I didn’t have everyone’s number anymore. The police came. I learned that the man with the shotgun had attempted to rob someone right in front of my house. The victim had struggled and run away. The robber had shot after him. Thank God, he missed. Later, I learned that the man I saw walking purposefully down my street had murdered a young MTV executive just two days earlier with the same shotgun. That young victim had lain dead outside his home for five hours. None of his neighbors had heard the gunfire or noticed a bleeding man on the sidewalk. I wonder if the same thing could have happened that night on my street. Jennifer Ferro is the general manager of public radio station KCRW and a fellow at the Center for Social Cohesion at Arizona State University. *Photo courtesy of Jennifer Ferro.